Welcome to GALA Yuzawa - powder snow within easy reach from central Tokyo! You can leave Tokyo early in the morning and actually be on the slopes riding the powder snow before 8:30am (train details for the 2018-2019 season coming soon. GALA Yuzawa offers a selection of challenges for all levels of skiers and snowboarders as well as playing in the snow activities for children. You can also take lessons in English, Chinese and Thai as well as English! GALA Yuzawa is located close to the centre of Yuzawa Town in Niigata Prefecture - about 200km to the north of Tokyo. Each season huge amounts of snow falls in this region and GALA Yuzawa often enjoys excellent snow conditions - the base is at an altitude of 800m. How do I get to GALA Yuzawa? By train you can easily get to GALA Yuzawa by using the Joetsu Shinkansen (bullet train) direct from Tokyo Station or Ueno Station to GALA Yuzawa Station (or nearby Echigo Yuzawa Station). By car, take the Kanetsu Expressway to Yuzawa I.C. The base of GALA Yuzawa is located about 3km from Yuzawa I.C. 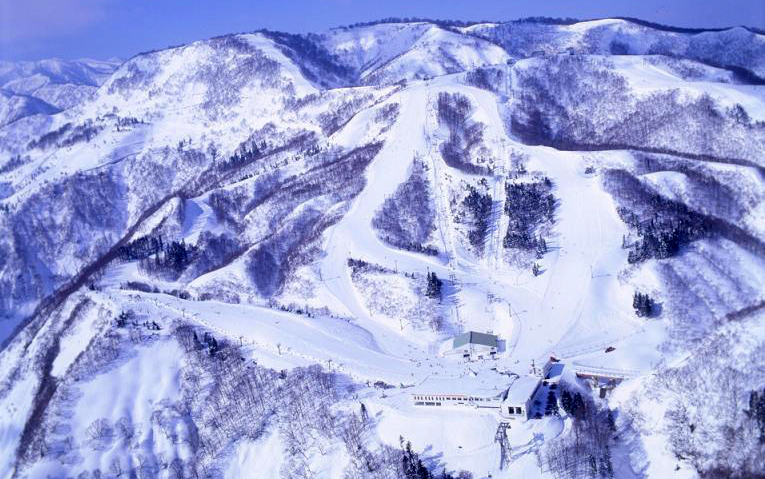 GALA Yuzawa has a 2.5km downhill course letting you ski or snowboard down to the bottom Ski Center. 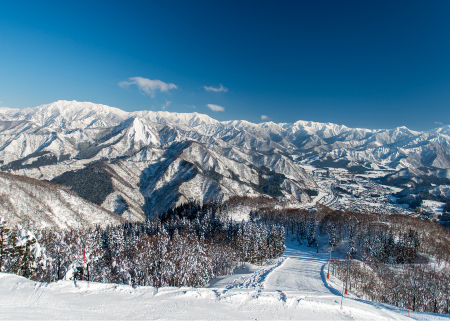 Enjoy a downhill run of 573m vertical with fine views of the Minamiuonuma valley to the north. 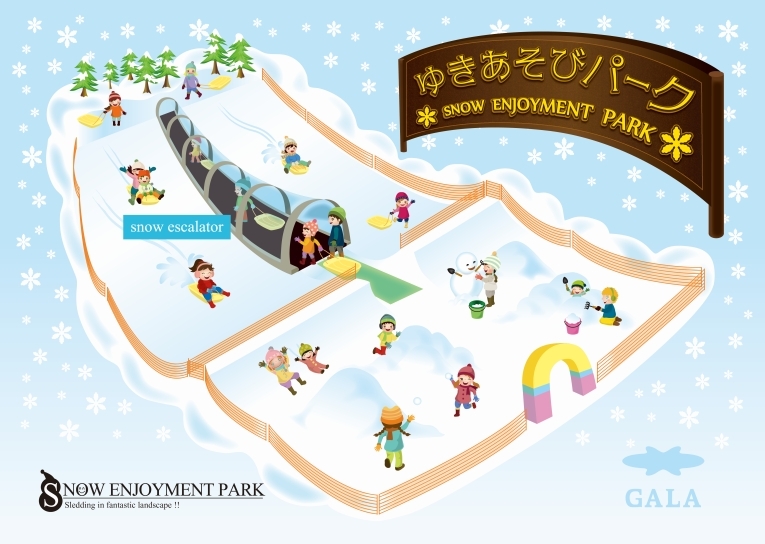 The 'Snow Enjoyment Park' (Yuki-asobi-park) is expanded for the 2018-2019 season. The Southern Area of the resort is great for those seeking a challenge and untouched powder snow. 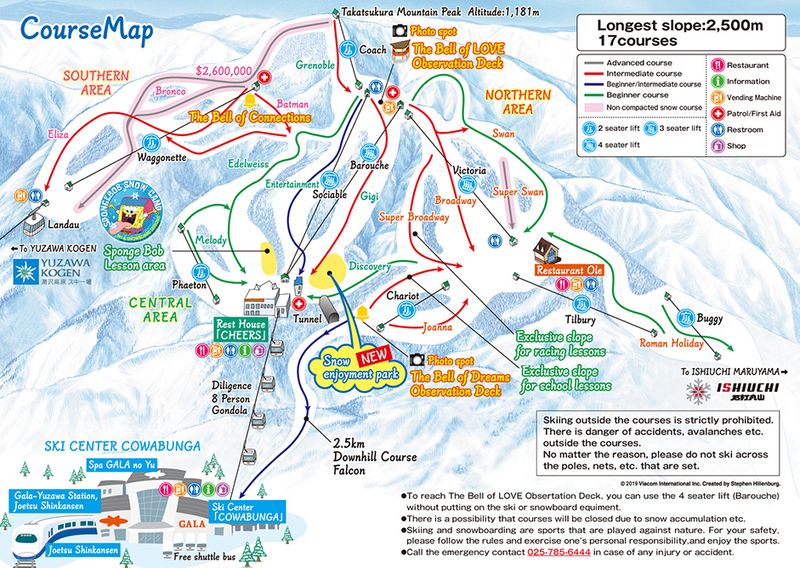 Learn to ski or snowboard - lessons in English, Chinese and Thai are available. Yuzawa Kogen is linked to GALA Yuzawa by ropeway in the Southern Area and linked to Ishiuchi Maruyama by chairlift from the Northern Area. A special ski lift ticket that covers all three ski resorts is available. These tickets are valid at Yuzawa Kogen and Ishiuchi Maruyama as well as Gala Yuzawa. All three resorts are connected by lifts/ropeways. This ticket is on sale for use between 29th December 2018 until 31st March 2019 (dependent on snow conditions). * Sleds and long boots are also available for rental - 1,500 yen for one day or 2,300 yen for two days. Getting to GALA couldn't be much easier from the Tokyo region with the base building housing both a train station and the Gondola to the slopes! The resort is located close to the center of Yuzawa Town in Niigata Prefecture. Take the Joetsu Shinkansen (bullet train) from Tokyo Station and within 80 minutes you can be at GALA Yuzawa Station and minutes away from boarding the Gondola up to the slopes and powder snow - the station and gondola are in the same building! (Actual travel times will depend which train is used). There are two Shinkansen stations in Yuzawa town - the main 'Echigo Yuzawa Station' and the resort's own winter-only 'GALA Yuzawa Station'. If you take the train to Echigo Yuzawa Station, free shuttle buses are available to take you on the 5 minute ride to GALA Yuzawa snow resort. GALA Yuzawa provides a regular (free) Shuttle bus for people already in Yuzawa or getting off at the Echigo Yuzawa Station. The bus can be taken from either the East or West exit of Echigo Yuzawa station as well as other stops on the way. Please note that at times of extreme weather conditions, buses may run later than their scheduled times. From Yuzawa IC on the Kanetsu Expressway toll road, turn right into Route 17. After about 2-3km you will see the GALA Yuzawa station on your left hand side, and soon you will also see a GALA signpost on the side of Route 17 - turn left here and you will soon be at GALA - just 5 minutes from the IC. Car parking is free this season.